Moore turned to Rutgers Professional Golf Turf Management School when he needed technical training to match his turf industry experience. Brian Moore aspired to work at a top 100 golf club, and his Rutgers certificate has helped him make that dream a reality. Brian Moore has been around the turf management industry his entire life. During high school he worked as a caddy and he genuinely loves teeing off himself. By the age of 25, he had already spent 6 years working as part of a grounds crew and had seen the full spectrum of courses, from small public to large private facilities with big budgets. But like many young turf professionals, Brian needed technical training to match his experience, so he came to Rutgers. 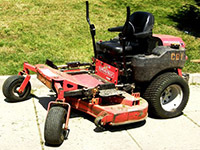 Brian chose the Rutgers Professional Golf Turf Management School because of its reputation. "Some pretty top superintendents went here," he noted. When deciding on a school, Brian had the choice of enrolling in an online turf management degree program or coming to Rutgers. He chose Rutgers over an online school "because hands-on interaction and a group learning environment are so important." Knowing the prestige and salary potential that comes with working at an elite golf club, Brian had aspirations of someday becoming a golf course superintendent working at a top 100 club. After completing the two-year certificate program at Rutgers, he was able to achieve that goal. He is currently employed as the Assistant Superintendent at the Chicago Golf Club, which was ranked #17 on Golf Digest's 2011 list of America's 100 Greatest Golf Courses. Chicago Golf Club is located in Wheaton, Illinois. For information, call (630) 665-2988. Rutgers put Moore on the path to success - and an Assistant Superintendent position at the Chicago Golf Club.